Television programming as of 2010 is all about showing reality without censorship, meaning that child watchers are inundated with shows depicting physical and sexual violence, as well as the use of illegal substances and harsh language. Unfortunately, due to this proliferation of negative media content, it may only be a matter of time before life imitates fiction, and children begin to copy the acts they view. According to the American Academy of Pediatrics, "Extensive research evidence indicates that media violence can contribute to aggressive behavior, desensitization to violence, nightmares, and fear of being harmed." 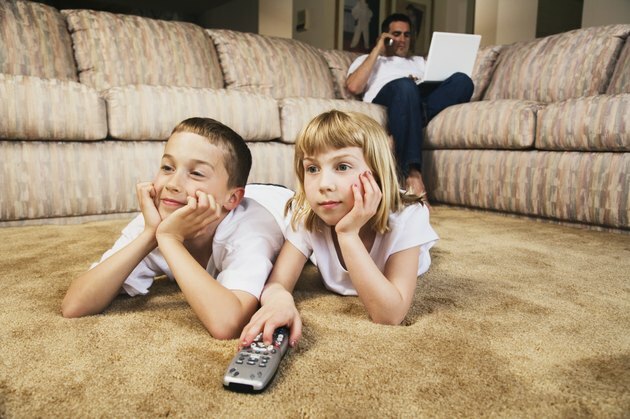 According to the American Academy of Pediatrics website, children between the ages of 2 and 18 spend an average of three hours each day watching television. A three-year National Television Study, reported by the AAP, found that children's shows had the most violence of all television programming. Statistics read that some cartoons average twenty acts of violence in one hour, and that by the age of 18 children will have seen 16,000 simulated murders and 200,000 acts of violence on television. Young people are especially in jeopardy of the negative effects of television violence because "many younger children cannot discriminate between what they see and what is real," reports the American Academy of Pediatrics. An estimated 70 percent of Americans are concerned about the moral standards portrayed in movies and on television, according to Princeton University. In an age where children have easier access to inappropriate content, parents may worry about what their children are exposed to, whether it be on reality shows, in movies, through music or violent stories read online. Studies have shown that children who are extensively exposed to violence on television can have trouble with moral reasoning. According to the article "Media Violence," the American media shows heroes justifiably using violence as a means to resolve conflict. The American Academy of Pediatrics website suggests that prolonged exposure to this type of violence increases acceptance of violence as a means of solving problems. The 1995 to 1997 AAP National Television Study showed that 61 percent of programming "portrayed interpersonal violence, much of it in an entertaining or glamorized manner." Children are drawn to such programming when the violent act seems surreal and the lack of consequence attractive. According to "Children, Adolescents, and Television," 37 percent of parents reported their child being frightened or upset because of a television news story. While children are watching television, they are being bombarded 60 percent of the time with various images of violent acts. Viewing hour after hour of violence increases the likelihood that a child will see the world as a dark and sinister place. The American Academy of Pediatrics calls this the "mean world" syndrome. "Fear of being the victim of violence is a strong motivation for some young people to carry a weapon, to be more aggressive," claims the American Academy of Pediatrics website. Violence portrayed on television is shaping the attitudes and manners of society. "More than 3,500 research studies have examined the association between media violence and violent behavior; all but 18 have shown a positive relationship," states "Media Violence." Repeated exposure to violence on television increases the likelihood of responding to others with violence. The American Academy of Pediatrics reports that, every year, more than 150,000 adolescents are arrested for violent crimes.